All transactions are safe and secure with a reliable history in online purchasing behind each of our associates. Buy the Got Dirt? t-shirt to own Dirty Jobs clothing and merchandise. Recite your favorite Mike Rowe quotes in this "got dirt?" tee that parodies the popular "got milk?" ads. Will Mike's willing attitude and lack of experience be the lethal combination that results in him making "a critical oversight that has led to yet another mouthful of poo." Mike has encountered mouthfuls of poo on various Dirty Jobs episodes. Let's just hope that we can learn from Mr. Rowe should we ourselves come face-to-face with the smelly brown stuff. In addition to the Got Dirt? 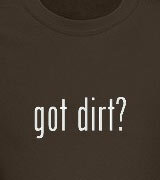 tee above, browse the Dirty Jobs Clothing Gallery for more apparel like men's and women's clothes, kids shirts or hoodies.